The action around the web is beginning to heat up for UFC 79 and Matt Hughes and Wanderlei Silva are drawing the most betting action thus far. 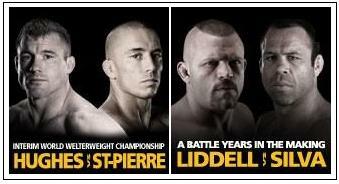 According to Bodog, bets are coming in at a 5-1 pace for the Axe Murderer Wanderlei Silva to beat Chuck Liddell. It seems by the numbers that the betting public is truly writing off Chuck Liddell at this point. I think many MMA fans are weary of betting on Chuck due to his recent losses to Keith Jardine and Quinton Jackson. However, Wanderlei Silva is also in the same boat as he has lost his past two bouts to Dan Henderson and Mirko Cro Cop. In the main event of the night, Matt Hughes as a +160 underdog is holding a slight edge in betting action over his opponent Georges St. Pierre in the main event. This was actually a surprise to me due to the fact that GSP is a reasonable favorite (-200), and also GSP has been drawing the most attention for this bout in the MMA media. The only other fight to have odds for UFC 79 is Lyoto Machida and Rameau Sokoudjou. The betting action for this fight so far has been 50/50.